One of the most important principles of science is attributed to 13th century philosopher William of Ockham and known as Ockham’s Razor. It is the methodological principle of ontological parsimony: when presented with alternative explanations always opt for the simplest, the one with the fewest possible causes, assumptions or variables. This book is an appeal to Ockham’s Razor, for it offers a much more economical account of special and general relativity than is present in the traditional development of relativity theory. 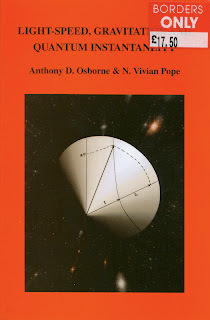 In fact, the extent of the simplification of relativity offered by Anthony Osborne and N. Vivian Pope is such that a theory which could hitherto be fully appreciated only by those with advanced university-level mathematical training, can now be understood with little more than high school maths. But, in this book, simplification is not the same as dumbing down. Osborne and Pope present a rigorous, scholarly and philosophically coherent re-appraisal of the fundamental tenets of both Newtonian and Einsteinian physics and some of the consequences of that physics to both quantum physics and cosmology. That re-appraisal has consequences that go far beyond an incremental re-working or adjustment of existing results. If the theory presented in this book turns out to be correct it would presage a paradigm shift in physics that would not only challenge the academic establishment but also change the way that ordinary people think about the material world. Let me give an example. Newton's first law of motion states that every object in a state of uniform motion tends to remain in that state of motion unless an external force is applied to it. In other words, that the 'natural' state of motion is in a straight line. Osborne and Pope propose an alternative first law of motion: the natural (force less) state of motion is orbital. I.e. that bodies continue to orbit unless an external force is applied. Now the Universe is full of orbital motion. From the micro-scale - electrons in orbit around nuclei, to the macro-scale - moons around planets, planets around stars, rotating galaxies etc. If this alternative first law is true, it would mean that we don't need to propose a force of gravitational attraction to account for orbital motion. This is compelling not least because it leads to a simpler and more elegant explanation. It would also explain why - despite vast effort and millions of dollars worth of research - no empirical evidence (gravity waves or gravity particles) has yet been found for how gravity propagates or acts at-a-distance. A common-sense objection to this idea is "well if there's no such thing as gravity what is it that sticks us to the surface of the earth - why don't we just float off?". The answer, according to Osborne and Pope, is that the natural (force less) orbital radius for you (given the mass of your body), is quite a long way towards the centre of the earth from where you now sit. So there is a force that means that you weigh something, it's just not a mysterious force of gravity but the real force exerted by the thing that restrains you from orbiting freely, i.e. the ground under your feet. The world is, of course, full of alternative theories. One reason that this one deserves to be taken seriously is that it is experimentally testable. That experiment is conceptually simple: take a spinning mass; spinning one way it should weigh a little more than when at rest, spinning in the opposite direction it should weigh a little less. The problem is not conceptual but practical: the weight change predicted by Osborne and Pope is small (about one hundredth of a milligram for a 175 gram disk spinning at 18,000 revolutions per minute), thus the experimental apparatus would need to be both very strong to cope with the energy of the spinning disk and very sensitive to be able to accurately measure the weight change. The experiment is certainly difficult, but not impossible with today’s technology. What is important here is that Osborne and Pope are not asking for the ideas presented in this book to be taken on faith. The Pope Osborne Angular Momentum Synthesis can be proven, one way or the other. This book deserves to be read and it deserves to provoke controversy. This work is not popular science. 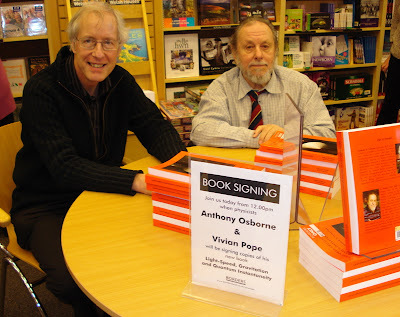 It is the culmination of a 20 year collaboration between Osborne and Pope, and a 50 year intellectual journey by N Vivian Pope (quite literally, a life’s work). To anyone who cares about the truth in physics, I commend this book. This is my foreword to this book, launched today at Borders bookshop, Swansea. The ideas in this book are significant and heretical; to paraphrase Daniel Dennett, these are Dangerous Ideas. Great evening at the Dana Centre Tuesday. A public debate/discussion called Techno Bodies - Hybrid Life? "What counts as a hybrid life form and how it affects you." 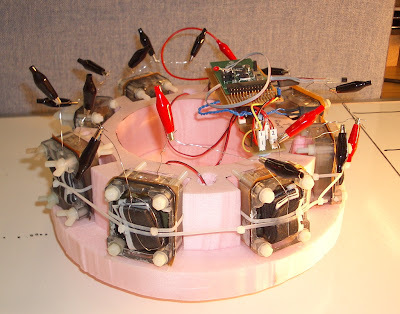 My contribution was to lead a discussion about the lab's Ecobots - starting with the Slugbot, then Ecobots I and II (famously fly eating robots powered by Microbial Fuel Cells), a little about what's next - Ecobot III - and to speculate about possible future applications for these hybrid-life robots. Hybrid life..? I'd never thought of these robots as hybrid life before but I guess the marrying of bio-chemical processes with plastic, metal and silicon does blur the boundaries. Here's a picture of the Ecobot II, built by colleagues Ioannis Ieropoulos, Ian Horsfield, Chris Melhuish and John Greenman. Remarkably this robot runs for about 12 days on just 8 dead flies. I was going to blog here about the various interesting questions that came up in discussion, but I don't need to because SciencePunk has done it already, so go here for a great summary. Every New Year the Edge poses a question and publishes the responses from among the world's intelligentsia. It's fun to read the responses but, even more fun to write your own. This year's question is What have you changed your mind about? Why? With the rather important sub-text science is based on evidence. What happens when the data change? How have scientific arguments or findings changed your mind? The sub-text makes all the difference. Without that we can all think of things we've changed our minds about. But how often are we faced with major paradigm shifts from one set of views to a completely different set, based on scientific evidence, and quite possibly in the face of our own prior beliefs or prejudices. Rarely, I'll bet. Most scientists tend to be educated within a particular tradition and then remain within its established dogma throughout their working lives. Without doubt the most profound scientific change of mind I have experienced (which took many years) is in relation to Newton's first law of motion, which I now believe to be wrong. However, I discussed this two years ago, in response to the Edge 2006 New Year question, so I won't repeat it here. So, what else have I changed my mind about? Well, in November 2007 I was lucky enough to be invited to a University of Bristol workshop on Mathematical Models of Cognitive Behaviour. The assembled speakers covered a broad spectrum of topics, but one in particular really caught my imagination. Dennis Bray's brilliant and illuminating talk introduced the computational processes going on inside the single cell, e-coli. I learned, to my astonishment, that single-celled micro-organisms have a complex repertoire of behaviours including memory and adaptation (in addition to finding food and reproduction). Behaviours that one normally associates with far more complex multi-celled organisms with nervous systems.Yet these are creatures with no nervous system. But, as I learned, an exquisitely complex set of molecular computational processes are present within the dense chemical soup (cytoplasm) encapsulated within the cell. Dennis explained that for e-coli, for instance, we now have a kind of circuit diagram of the complete set of computational processes. But it's far from simple! Our robots are simpler than the simplest single-celled micro-organisms.